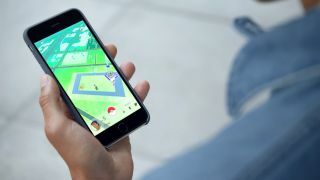 The game we have now is just the "tip of the iceberg"
In a case of "better late than never", it was recently revealed by Niantic Labs that its immensely popular Pokémon Go game would soon be making its way onto the Apple Watch, leaving Android users eyeing their own smartwatch in disappointment. Now, Niantic's CEO John Hanke has dispelled suspicions of exclusivity at TechCrunch's Disrupt conference, stating that it's looking "pretty likely" the game will be coming to Android Wear as well as other mobile platforms. As responses to a direct question about Android Wear plans go, it's not quite as committal as we'd like, leaving us wondering whether or not Hanke has promised not to detract too much attention from excitement around the game's imminent arrival on the Apple watch. Expanding out to other platforms will be a key move for Niantic to keep interest in Pokémon Go alive. The game might well be the most downloaded app in its first week ever and the fastest mobile game to earn $500 million in revenue but it's also recently been reported that its number of paying players has dropped by 79%. Niantic Labs don't seem to be particularly worried about this, though. Building on their experience of creating and sustaining the mobile community around their title Ingress, Hanke revealed the developer has a few new features in its poké balls to keep player interest when the novelty of augmented reality Pokémon catching has faded. The new "Buddy Pokémon" feature which allows players to add their favorite Pokémon to their avatar and collect candy whilst walking is apparently just the beginning. Once the game's worldwide launches are complete, Hanke said a feature we can expect to see come to the game is Events. It wasn't entirely clear how or with what frequency these events will take place, but Hanke did say they would involve the release of new Pokémon, giving players more than the original 150 to catch. Kanto purists everywhere scream. Another planned feature that will certainly pique interest is player versus player battles. Battling other players outside of gyms is a huge part of the Pokémon universe, both in the original games and in the animated show so it's unsurprising that it's something Niantic are strongly considering adding to their own game. Hanke didn't make it clear when we could expect to see any of these features arrive, of course. He did, however, say that the version of Pokemon Go we have now is just the "tip of the iceberg" for his vision of where he wants the game to go and that he thinks "it will change substantially over the years."